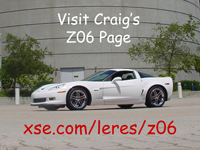 This is my Ron Fellows Z06 Corvette page. My 2007 Z06 was built on March 26th, 2007. It's powered by a LS7 built by Kerry Rasmussen on March 15th 2007 at the Performance Build Center of the General Motors Powertrain Facility in Wixom, Michigan.